The Rhône-Alpes region is large and mountainous. Two great mountain regions, the Alps and the Massif Central, are run through by the Rhône Valley running north-south between them. Mont Blanc is literally the highpoint, surrounded by pretty alpine villages and less attractive, but purpose built ski resorts. But there’s also charming Annecy, on sublime Lake Annecy, Belle Epoque Évian on Lake Geneva and vibrant, foodie capital Lyon. Choosing the best places to stay in the Rhône-Alpes region is a challenge. There are some exceptionally beautiful châteaux, dreamy ski chalets, remote mountain retreats and great design hotels in the heart of lively cities. But our Gurus have done their best to refine their local recommendations to create a list of the best places to stay in the Rhône-Alpes region. Capital Lyon is THE destination for foodies. Crucible for top international chefs, Lyon has a lively eating and drinking scene which continues into a post-restaurant-closing hours scene when the restaurant staff enjoy their own eating and drinking. As well as rich Lyonnaise cooking, this city is rich in culture, with plenty of history to uncover, art to experience, treasures to purchase, and even civilised strolling to be done along an elegant web of boulevards. Skiiers should hone in on the Savoie region, as should climbers and anyone after an alpine adventure. Savoie is especially peaky up by the border with Italy, and as well as majestic Mont Blanc, Savoie is also where you’ll find the Belledonne Massif, Mont Cenis, the Lauzière Massif. Savoie is also known for its cows, which also means cheeses: Reblochon, Beaufort, Savoie Gruyère and Tomme de Savoie, and its wine. The Haute-Savoie is a pretty alpine slither of France, in between Switzerland, which is across Lake Geneva to the north, Mont Blanc and Italy to the east and Savoie to the south. Évian, home of bottled water, is here, as is the pretty traditional French alpine town of Samoëns. This department is also known for its traditional, rural villages, very different from the cosmopolitan France you find when you visit Paris. The Ardèche surrounds the Ardèche River in south central France, and is known for its spectacular gorges and karst features - some of its caves were inhabited by prehistoric humans - and peaceful, rural atmosphere.To really see the Ardèche you probably need access to your own car. The river winds between towering limestone cliffs creating the magical gorges with their surprising colour and dramatic views, and you’ll need a car to se the most stunning sights - like the naturally created bridge, the Pont d’Arc. There are also a number of very beautiful châteaux in the region. Use our guide to the best places to stay in the Rhone-Alpes and start planning your adventure! The Chateau de la Tour du Puits is a beautiful, ivy clad château surrounded by a rural landscape. There are seven charming rooms with wonderful views across the gardens, plus lovely original features. Then there are all the modern comforts you might need, like a spa, gym, outdoor pool and an elegant bar. There’s also a restaurant serving great regional cuisine. The Domaine de Chalveches in the Ardèche is a chic, modern property with beautiful mountain views. Each of the ten rooms and suites is individually designed, but with nature in mind, and there’s a spoiling spa. 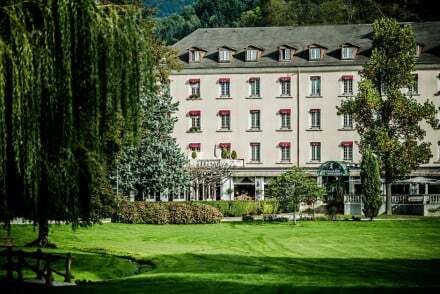 Annecy’s Abbaye de Talloires is a beautiful mountain escape, converted from a stunning monastery, set right on Lake Annecy, the Abbey de Talloires has 33 spacious rooms, some with free standing baths and lake views. There’s also a gourmet restaurant. Yoann Conte is also on Lake Annecy, an eight room restaurant with rooms with two Michelin stars. The interiors are fabulous with a luxurious alpine feel and you’re beautifully secluded from the outside world. The Hotel Ermitage looks out over Lake Geneva. 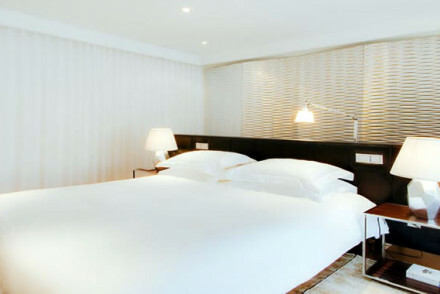 It's a stylish modern hotel with 80 contemporary rooms and access to a golf course and a luxury spa. They even offer babysitting and children’s activities and some equally well organised activities for adults, like snorkelling, tennis and fishing. 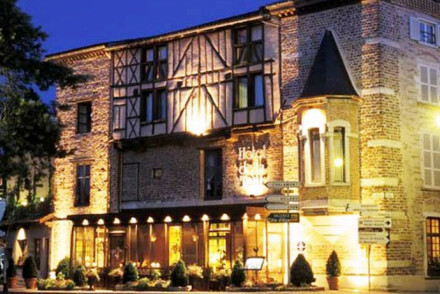 Grenoble’s Le Grand Hotel is smart and functional, very close to the centre of town and the main tourist office and a short walk from some of Grenoble's excellent restaurants. 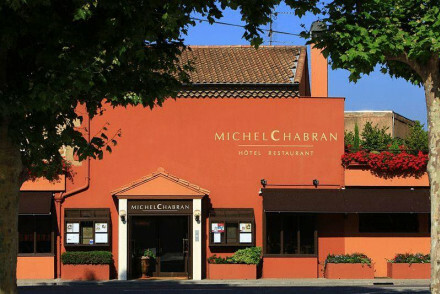 The Hotel de la Villeon in Tournon-sur-Rhône is a beautifully renovated property in a pretty village in an unspoilt corner of France. The rooms are large, light and elegant and there are lovely gardens. Château Clément in the Ardèche, is a wonderful, period French château with just five individually decorated rooms and light, airy interiors. There’s also a heated outdoor pool and an indoor pool in the spa - and the food is great, even offering onsite patisserie classes. Lyon’s Hotel le Royal doesn't just have a great restaurant, it's also got a lunchtime cooking school. Classical elegance, and everything you could need. Cour des Loges is grander. In fact it's nothing sort of spectacular. More than just beautiful, the decor here borders on the theatrical. Five stars worth of individualised design, hand painted murals and silk tapestries and a Michelin star restaurant. Romantic and special. The Château des Allues in Savoie is a haven for foodies who love the great outdoors. There are just two bedrooms, so it’s private and peaceful, but the restaurant is quite something, fed by the château's own huge organic kitchen garden. There’s also a beautiful non-edible garden, and as well as workshops for foodies the château also hosts workshops for gardeners. The decor is comfortable but quirky. One of the newest and best places to stay in Courchevel for luxury is Le Strato. It's not just five star - it has a gastronomic restaurant and gorgeous pool and spa. Even their fireplaces are designer, and when you finish your supper your gloves and boots are returned to you pre-warmed. Hotel des Dromants is a luxury hotel in Avoriaz, featuring a quirky ultra modern design. Futuristic rooms take their inspiration from the 1960’s and most enjoy spectacular views. Plus there's an excellent restaurant specialising in Savoyard cuisine, a small spa, and the bar is a popular apres-ski hangout. Boasting one of Méribel’s most respected restaurants, Hotel Le Grand Coeur is an all round winner with luxurious rooms, and amazing service besides the gastronomic delights. The tradition and authentic feel of L’Oree du Bois will take those fortunate enough to be staying here back into the original spirit of Méribel: no unnecessary pampering, just dignified charm. The piste side location will quickly get you and the tots into the swing of things. 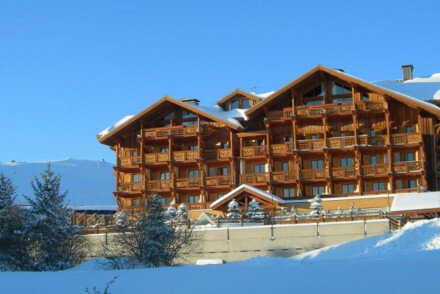 La Feline Blanche in Saint Gervais-les-Bains is a small hotel that represents great value for money in the centre of the village and ideally placed for all the available activities. It has a cosy rustic feel and has great alpine views. Rooms start from as little as €85 per night. Still not sure which is the best place to stay in the Rhône-Alpes for you? 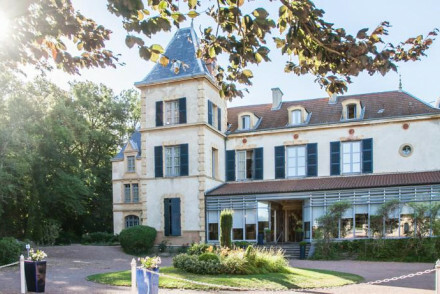 Browse through our list of all the best places to stay in the Rhône-Alpes, or contact one of our friendly Gurus for advice. A traditional 18th century house in a charming village. Just five rooms, sleeping 3 each, some modern, some more traditional. Large living area and communal kitchen, pool and gardens. Excellent value for a family or a big group of friends. Low-key and laid back. Traditional - An 18th century house with Austro- English furnishings. Sights nearby - Historic monuments to explore in the village. Set in a 14th century, renovated mansion in the medieval town of Chatillon-sur-Chalaronne nestled between Burgundy and the Alps. With a five star menu and fantastic wellness centre, this is a great location to escape life's hustle and bustle. Decor combines classic French chic with modern luxury. 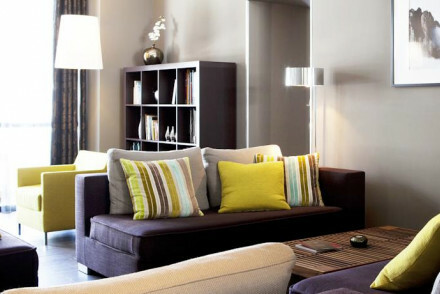 Spacious rooms are decorated in a simplistic, Provençal style. The quiet, cosy ambiance and evening meals on the verandah, eating Michelin starred dishes make this perfect for a romantic retreat. All this plus a golf course and vineyards nearby. Great value. 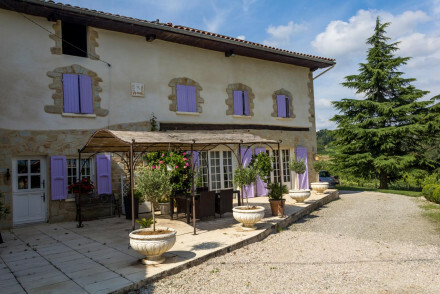 This charming country B&B sits in the picturesque landscape between Valence and Grenoble. The best of the spacious and bright rooms have private patios where you can relax with a glass of wine. Take a dip in the jacuzzi overlooking the verdant countryside or book a massage. A quiet, rural delight. A delightful, secluded 16th century chateau in the picturesque town of Villerest. It's stylish, luxurious rooms are individually decorated in accordance with different spices. Take a tour of the chateau's vineyard or explore the charming surrounding villages and chateaux. A romantic castle escape. Romantic Break - A charming and romantic spot with chic interiors, on site spa and splendid gardens. Sights nearby - Explore the fortified villages of Villerest and Saint-Jean-Saint-Maurice. Great walks - There are beautiful walks in the countryside of the Côte Roannaise. A modern and cosy chalet overlooking Grandes Rousses peaks. Rooms and suites decked out with wooden floors, warm furnishings and private balconies. Restaurant, spa and pool. A wonderful choice for a couple or group's winter adventure weekend.